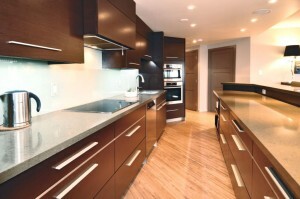 The 2011 market had proven to be the year of the condominium. Palace Place is currently experiencing LOW inventory and BIG demand! The weather in January has proven to be very mild. Because of the good weather and incredible lending rates, more buyers than usual have been out looking for condominium residences at Palace Place. Unfortunately, only two properties have been listed on MLS. This has created a great seller’s market opportunity for Palace Place owners interested in selling. Get a record price for your condominium residence. Call me today! 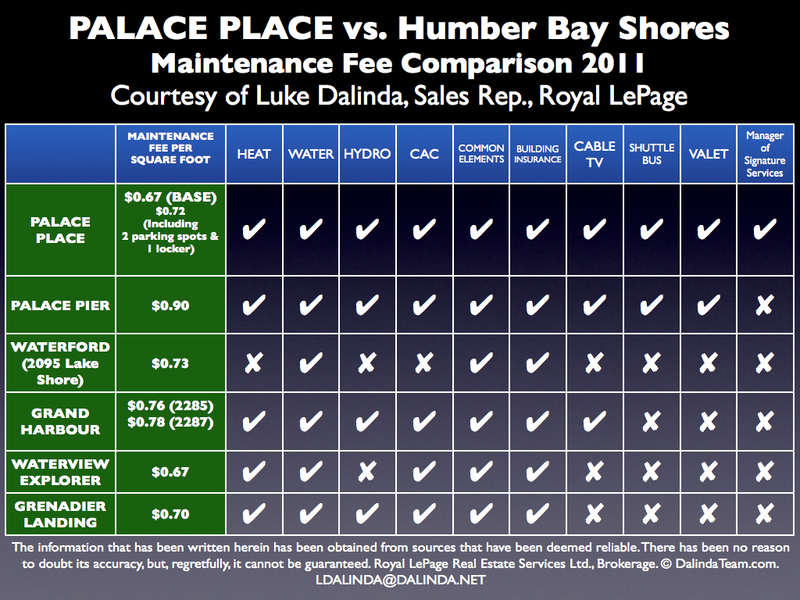 Palace Place is the best-built building in Humber Bay Shores. We have the lowest maintenance fees and the most services. 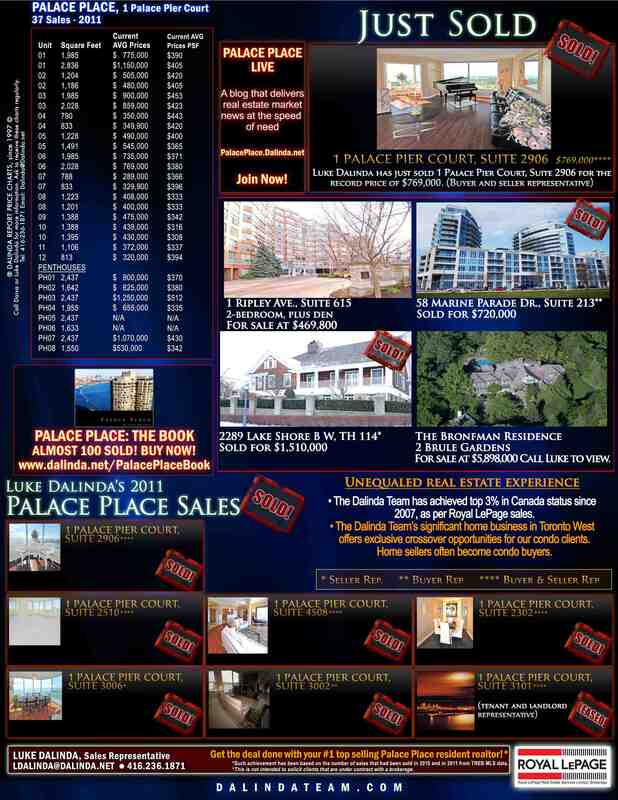 Why would you pay your out-of-area realtor friend, who has never done a deal at Palace Place, to sell your suite? Is that friendship worth sacrificing $25,000 to $50,000 of your hard earned money? You do not pay a realtor to let your property sleep on MLS. You pay a realtor to use every available resource to get you a record price! Ottawa wants to crack down on the condo market. The Toronto Real Estate Board reports a 10.5% increase in sales. The Toronto Real Estate Board had reported a 10.5% increase in condo sales in the fourth quarter of 2011 from the fourth quarter of 2010. 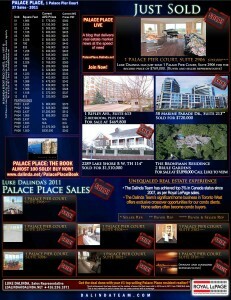 The Toronto Real Estate Board’s press release has been enclosed. A masterpiece by HGTV celebrity contractor, and former Palace Place resident, Jim Caruk. Join us today! 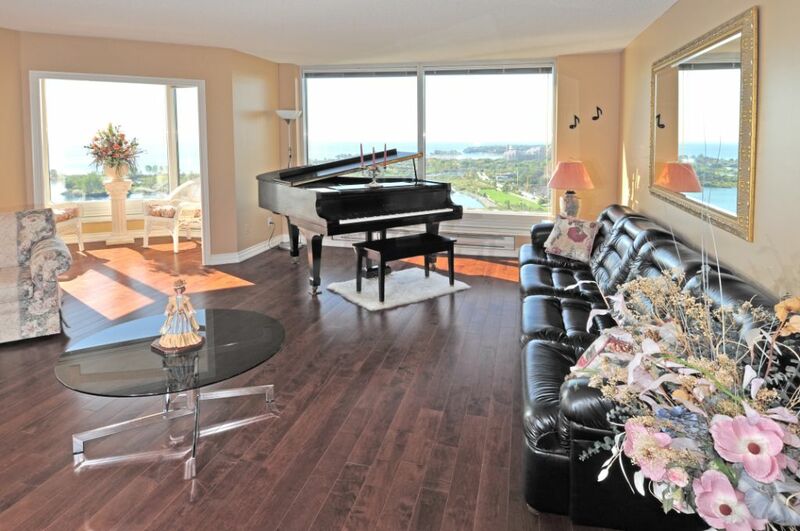 Join us today for an open house at Marina Del Rey, 2267 Lake Shore Boulevard West, Suite 413 from 2 to 4 PM. Marina Del Rey is a luxury condominium community that had been built by Camrost on the waterfront in sought after Humber Bay Shores. Suite 413 is a stunning condominium residence, with 2-bedrooms, plus a den, approximately 1,210 square feet of living space, and a sunny southwest exposure, with lake view. This spectacular renovation by celebrity contractor, and former Palace Place resident, Jim Caruk & Alexander Interiors had been featured in the spring 2011 issue of Reno + Decor Magazine! CLICK HERE FOR THE FEATURE SHEET. On January 19, 2012, City of Toronto Mayor Rob Ford had issued the message that has been noted below to residents and businesses, including the Toronto Real Estate Board. It has been provided for your information. Yesterday marked an historic moment for Toronto taxpayers with City Council’s approval of the 2012 Budget. For the first time ever, the City of Toronto will spend less this year than it did the year before. The 2012 Budget has laid the fiscal foundation for 2013 and onwards. A clear message was delivered to City Hall following the 2010 municipal election. Residents in Toronto overwhelmingly supported candidates who ran on fiscally responsible platforms, making government more accountable and running the City more efficiently. On January 12, Executive Committee heard the message of voters and endorsed the 2012 Budget. Recommended measures to improving Toronto’s fiscal situation included allocating $154 million to TTC capital projects, a 2.5% property tax increase and holding the line on revenue estimates. The 2012 Budget has reduced the City’s reliance on one time revenue to cover costs from $327 million to $102 million. The modest property tax increase of 2.5% is the lowest rate of increase since 2001 and, of course, last year there was no property tax increase at all. This Budget puts Toronto on a stronger and sustainable fiscal path for future budgets. Even with additional budget items being approved, the City has reduced spending by just over $271 million and just over 1,000 positions have been eliminated from the City’s workforce. The TTC will now receive $135 million for the purchase of streetcars, subways cars and busses and $5 million for operating costs. Council traditionally makes recommendations to tweak and make small adjustments to budgets. The Council recommendations to the 2012 Budget are relatively minor considering the City’s operating Budget is $9.4 billion. Unfortunately we will still be having some of the same discussions next year because the 2013 opening budget pressure is now $200 million. Nevertheless, this is a major reduction from the $770 million dollar pressure we were facing at the beginning of 2011. This, ladies and gentlemen, is an incredibly significant achievement. I want to thank you all for your support during this budgetary process. You elected me to fix the City’s fiscal foundation and return respect for taxpayers as a core value to City Hall. This Budget achieves just that. TD Canada Trust announces a four-year special 2.99% fixed rate mortgage offer. The Dalinda Report, January 2012, is out! Find out what your suite is worth and how it compares to other luxury condominium residences in Humber Bay Shores. Palace Place, Suite 2906 sells for record price!